I bought some golden plums at a neighborhood fruit store. When I checked out, the store lady asked me to take some strawberries... free. A recent news about a US strawberry farmer destroying his crops (selling price too low the cost couldn't cover...) is still echoing in my head. 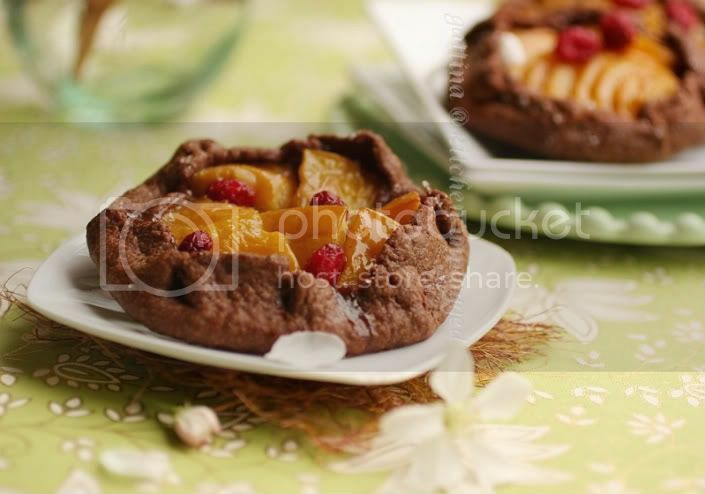 Anyway go back to this tartlet... the crust is crunchy, not too sweet but very cocoa-y. It pairs particularly well with citrus fruit, mimicking the sentiment of dark-chocolate covered orange peel. I did two versions for the plums - slices and cubes - for the tartlets. The flesh turns soft after baking, so if you prefer some bite I suggest you going for the cubes. please based on this recipe, replace the semolina flour with regular flour, add 1/8 cup cocoa powder, increase the butter (superb flavor is a must) to 70 g.
Once you form and roll out the dough, divide it to 5 circles. Spead some mermalade (I used plum's) in the center, arrange the cut plum on top, sprinkle sugar and dot with butter, wrap the edge up. Bake the tartlets in a (pre-heat) medium-hot oven for about 30 minutes. Those are fabulous little tartlets! I like that combination. Plums go perfectly well with chocolate. 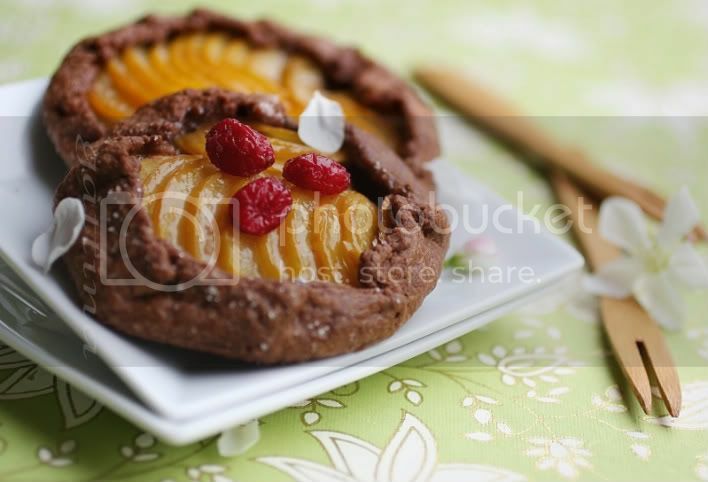 Fruits in baking and in desserts are always charming... these tarts are even more! Beautiful!! I love the rustic look of the crust. Our fruit season is ending now - winter is here. Going to try this tart before it's too late. Estos postres me gustan mucho! El chocolate de la arbadilla me encanta! Yummmm,...!!! Muchos besos de Bruselas!!! chocolate with fruit best of my love. Such a lovely dessert. Really fresh looking perfect recipe. Those look soo good, I will have to try them soon.. Thanks for the post !